First semi final of FIFA WC 2014 is going on. We plan to have some soda and icecream from Saddar bazar Sialkot during the half break. Tha Tha Soda is just 3 minute drive from our room. Whistle goes for the half and we are on bike to Tha Tha Soda. We reached there at 1.30AM. Tha Tha Soda shop was closed, but the thing which caught my sight was Iqbal Tower. Just imagine the time, month of Ramzan, heat of semi final and above all social set up of Pakistan. It dictates that no body should be out of its home after 11pm. But you would be astonished to know that almost 50 biked had been parked at the out skirts of Iqbal Tower and guys were lying on the base and attached paved path of Iqbal tower, relaxing, chatting, smoking and laughing like anything. 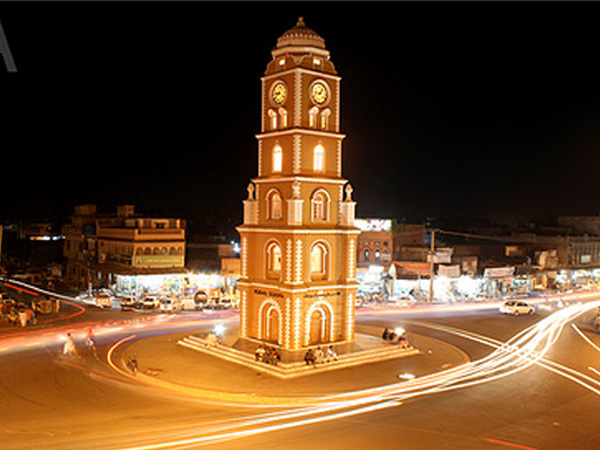 Iqbal Tower which is also known as clock tower is situated at the middle of the Saddar Bazar. This bazar is situated in the premises of cantonment of Sialkot. There is a huge clock installed at the top of tower and bells ring after each hour. It is a worthy piece of art and architecture, keeping the name of Iqbal and Sialkot up above. After Isha prayer, people start gathering around this tower. They sit here, make some snaps, chat, have drinks, smoke, laugh like anything in typical Sialkot style and this feast continues till 2am. Smoke and drink corners are there around the tower to keep the feast alive till 2am. Guys are rich, hardworking and positive here. They keep on cherishing the tie and air around. This is simply charismatic as I myself have been there many times. This is one of the bewitching beauties of Pakistan and worth visiting place. Did you ever spend some time around Iqbal Tower?? ?